Storm: This is the major pentatonic scale, a favorite note group for Eddie over major key progressions. And this is the Major Scale, laid out in a three-note-per-string pattern. Sets up nicely for hammer-on and pull-off runs. Storm: Eddie favors a lot of sus moves to flavor static chords, similar idea over the D minor chord in bar 3 of the progression. Bb and C major share the last bar to turnaround to the start. Another favorite sus move of Eddie's on the C chord. crow: This is from the 1984 era? Storm: From the 'Van Hagar' era. A bit like 'Love Walks In'. More than a bit, maybe. Here is a tab of the entire part. 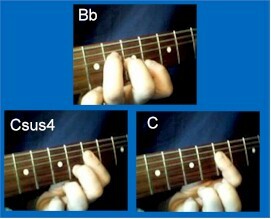 To get a keyboard sound on guitar, try using your thumb, index and middle fingers for the part. Something Eddie does often for it's piano-like sound and dynamics. Storm: And here come the licks for tonight. This riff moves slides of a whole step and back. Moving up the neck in 5th and 4th intervals gives this riff and wide sound with few notes. Ending with a whole step bend. Similar to a style riff in Van Halen's "I'll Wait". Storm: Here is a similar lick, out of the major pentatonic scale. Using bends instead of slides. I am running a pretty straight forward distortion setting. Bridge humbucking pickup. You could try a little phasing and/or delay would be Eddie approved. jlancaster: What makes a chord sus2 . . .sus4 etc.? 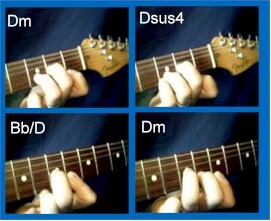 Storm: The replacement of the '3rd' of the chord with the named scale tone. This riff is a slippery 'legato' run. Consecutive hammer-ons, mostly from the major scale but with a couple of 'outside' notes. Eddie will add whatever notes sound good to him and always seems to make it all work. Storm: This next lick uses some extreme bends, of which Van Halen is fond. In the style of "When It's Love". Storm: This next lick uses a bend of 1 1/2 steps to start. With a stuttering sound caused by right hand muting. Then an extreme 2 step bend. Get the extra packs of strings ready. The licks will work anywhere in the track but the videos demonstrate the measures I thought them appropriate. Storm: This next lick throws in some 'rakes' into notes for drama. Some legato hammer-ons. Unison bends. A tapping riff on string 2 and a bend-tap-slide tap-pull-off and bend release. 5 riffs in one, which is like listening to one measure of Eddie Van Halen. Storm: The first note should show a hole step bend. Hole step = whole step. This next to last riff uses tapping through the major pentatonic scale. The same motif moved across the strings but changing the shapes to fit the key. Storm: This last riff uses a Van Halen trademark - 'tap' harmonics. Similar style riff heard in Van Halen's "Dreams" and "Poundcake". Storm: With this technique Eddie can actually bend the harmonic and put vibrato on them. Very cool. 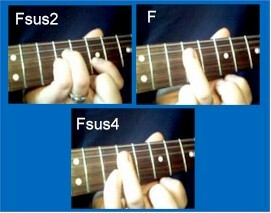 Play the 3rd string - 5th fret then hammer the index finger of your left hand over the 12th fret. You should get the overtone G. Do the same at the 10th fret for the octave, C. Hammer right over the fret. Heavy distortion helps. The moves in order go tap harmonic, bend, tap next harmonic, tap first harmonic, release bend, then next harmonic. fenderblues: Teach I am shopping for a new amp and I want to get somewhere around that Eddie sound but also play some more Hendrix sounding stuff. Do you have any suggestions? Storm: I had a 5150 amp and that was as 'brown' sounding an amp as you could find. Almost too much gain, though you could plug into the low gain setting too. Line 6 stuff I like a lot, very versatile. For the recordings for the site I use them. fenderblues: Storm, when i use my whammy bar it detunes it right away. Is there some way I can fix that myself. Storm: This riff uses the bar, depressed then releasing as you pick the note to 'scoop' up to pitch. Eddie uses a Floyd Rose tremolo which is very hard to knock out of tune. Locking tuners, roller nuts and graphite under the string at the nut are some solutions that don't require a new guitar or woodworking. Well maybe not the roller nut. Storm: Well that's it. One more Van Halen lesson to go. Eddie's keyboard playing uses small chord voicings, no more than three note. Usually over a bass note sustained or pedal. The bass guitar does the role in the jam track. Here are some of the chord voicings the first two bars of the progression are on an F major chord.